Baan Balinda is a village situated in the nice and quiet area of Huay Yai. With the development of the new high way, this is the spot to be. A stunning house with Thai ownership and 50/50 tax and transfer costs. This 2 bedroom house comes including: a european kitchen with all electrical appliences, fully air-conditioned, a private car park, 2 beautiful terrace areas, internet, cable television and a washing machine. 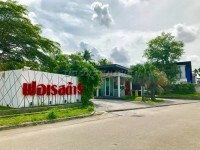 Not only this, but the area around here is filled with local restaurants and is in a neighbourhood that is easy to access Pattaya City Center.